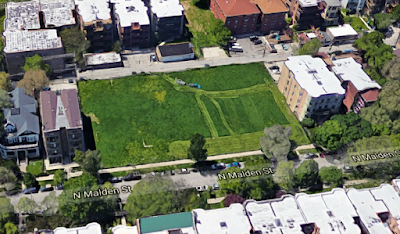 You know those adjoining empty lots on the 4600 block of Malden that have been empty for decades? The owner has proposed a plan for them. 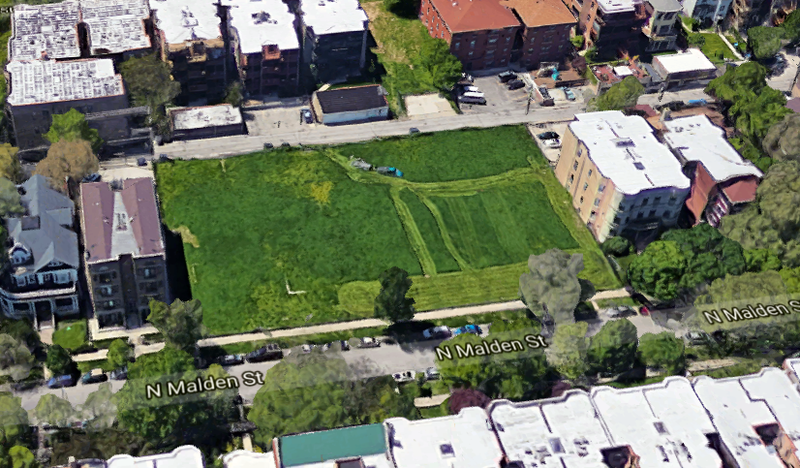 "ZONING PROPOSAL AT 4608-18 N. MALDEN. Steve Sgouras with Malden Development LLC is proposing two 25-unit residential rental buildings and 11 condominium town homes located in the back. This development would require a zoning change from a RT-4 to a RM4.5 and then to a residential planned development. Magnolia/Malden Neighbors will provide community feedback on Thursday, July 20 at 6:30pm at Weiss Memorial Hospital. Click here for more details about the development." You can see the developer's application with plans for the property here. Great news. Keep them market rate and no sro, no section 8. We already have an abundance of those on Malden. They only increase crime. Because this development requires a zoning change, it must comply with Chicago's Affordable Requirements Ordinance, which says that 10% of the units (six, in this case) must be made available to people earning up to 60% of the Average Median Income (about $32K for a single person or $39K for a couple). The developer has the option to offer fewer affordable units (but no less than 25%) and pay the difference into the Low Income Housing Trust Fund, which pays for housing for people earning very little (as little as zero percent of the Average Median Income). So no, there will not be an SRO at this address, and I don't know much about Section 8, but there will never be an all-market-rate building if a zoning change is required or if the developer is using government money to build it. When you say "(but no less than 25%)", what is the 25% in relation to? The requisite 6 affordable units, so 1.5 total? Also, the plans call the townhomes "condo", so not all of this is rental it seems. If some folks have a true stake in the property that is a good thing. Yep, 1.5 -- I don't know enough about how the ARO is implemented to know how that works. Probably rounds up rather than down, but that's a guess. If you read the developer's questionnaire, linked, it says six affordable units or their equivalent. One reason we are seeing so many rental units going in, as opposed to condos, is that the banks see the numbers: condo glut versus low number of available rentals. They are making loans for rental properties these days, not condo development. Ours is a quiet street. A development like this does not belong on a side street. It belongs on Clark or Wilson or Lawrence, but not our side street. 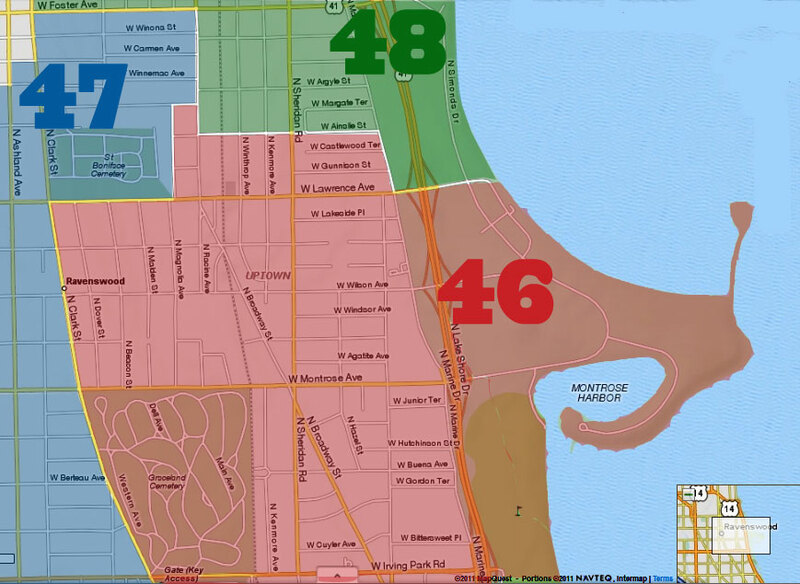 We have 9 apt buildings on the spread from the 4500 block of Malden to 4700. We have open units in the newly renovated high rise on Wilson. Blah blah. I've lived here, ON Malden for 22 years. This is NOT the street for a monolith like this project. Not at all. I understand he's been sitting on this land, waiting for the right time and hoping we'd let his variances go through, but no. Maybe you should call him and point to the vacant lots in the area, I know if none. And build what you like. 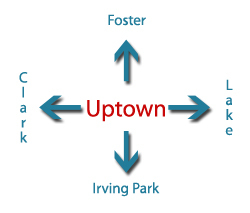 It seems that Uptown encompasses more than your street. By the way he is asking for an up zoning not a variance. Make it happen,very similar to the complex on Clark north of Lawrence. Right.. ON CLARK... not a sleepy side street. It has no business here. I looked at the Facebook comments and it will be interesting to see if this flies with the neighbors. Personally at first glance I like the density, but question the buildings in front and back style. It's a deep lot so maybe it would work better than I think. If I'm reading the zoning correctly it would be possible to build 40 units there now in the typical 3 story over garden level Uptown configuration. Since it's 250 feet wide add another story and you get up to 50 units. I'd suggest community consider giving the developer the added density, but keeping the more typical Uptown building style. One massive building matching the front lot line of the building to the south and say 240 feet wide would work nicely. Maximize space for units and no curb cut. Plus plenty of new neighbors to shop, dine and hang out in our lovely neighborhood. That lot does need to be developed. Biggest developable lot we have in Uptown on a side street. Then get that lot developed east off there on Montrose. After that some commercial parcels on Broadway that might be developed into residential, lot by Weiss, and we're done until teardowns become more common here. From what I have heard, the developer is only asking for a 4.5 zoning change from the present 4.0, this lot has been vacant for way too long and we need more eyes and ears to combat the gang activity. Developers take a risk in any endeavor and I applaud the developer for his long standing commitment to Uptown. If market conditions change, this may change the plans so My thoughts are: the sooner the better. The developer has owned these lots for over 25 years and has done very little to even maintain them. For the 8 years we lived at 4623 Malden, 1995-2003 my partner and myself would take our lawn mower across the street and after we picked up all of the trash we would cut the grass twice a month. Rewarding a negligent owner by gifting him the right to build an oversized and completely of character to the rest of the block building is not moving forward. Current zoning is not a hardship to building when you have owned property for 25+ years. Current zoning also has an overlay that requires a 30' setback to match all except for one building on the block. This setback covers most of Sheridan Park and is part of the value of the neighborhood. And the one building is his, that he built without the variance. Nope, he didn't build that one. I'm neither for or against the plan, however the misinformation people post is staggering. In other for any of our voices to be relevant ,we need to get our info straight, period!!! Yep Bill Morby, he should have build during Shiller's reign and given us more low income!! Bright idea. Reward? What reward are you giving him? He will either build without your input or leave it vacant. Great community minded response. How do you like living across from 4650 Malden? Does that bother you? The criminal activity across from you is better than the proposed improvement.